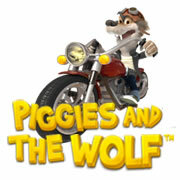 Fly Casino is pleased to release yet another exciting game Piggies and the Wolf! This three little pigs based game is full of free games, funny rewarding bonuses, and random wins. Our favorite is the Blow the House Down bonus. Piggies and the Wolf is a fun, rewarding, and unique game that our members are going to love. You can find Piggies and the Wolf now in both Download and Flash clients.